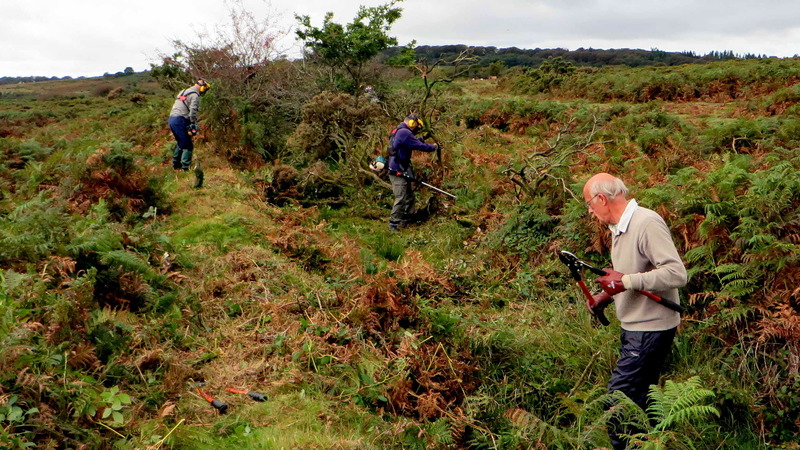 Friday 26th September saw a return of the DPA Conservation Team to Roborough Common to take up the cudgels once more in the battle against scrub taking over the Devonport Leat. 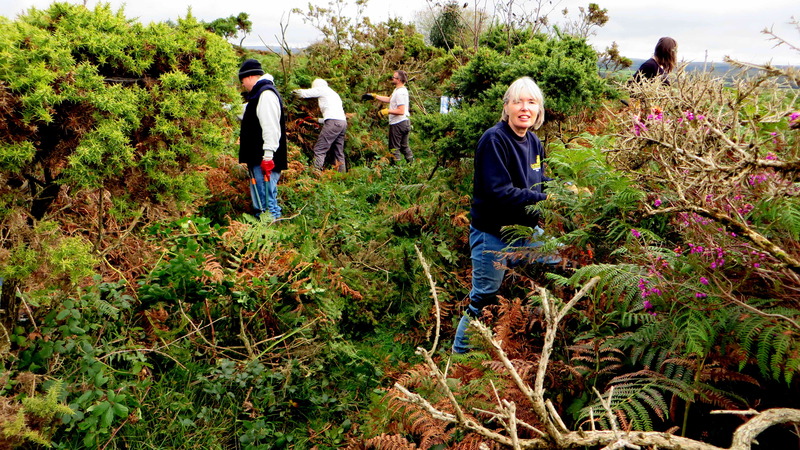 Today the DPA volunteers were Chris Francis, Derek Collins, Elaine Viant, Helen Wilson, Janet Reeves, John Francis, John Viant, John Watson, Keith Ryan, Nigel Peace, Rachel Watson, Stephen Barrow, Sylvia Hamilton and Val Barns; making 14. They were joined by a party of 10 Marketing staff from the University of Exeter (see below). Giving an idea of vegetation within the leat. 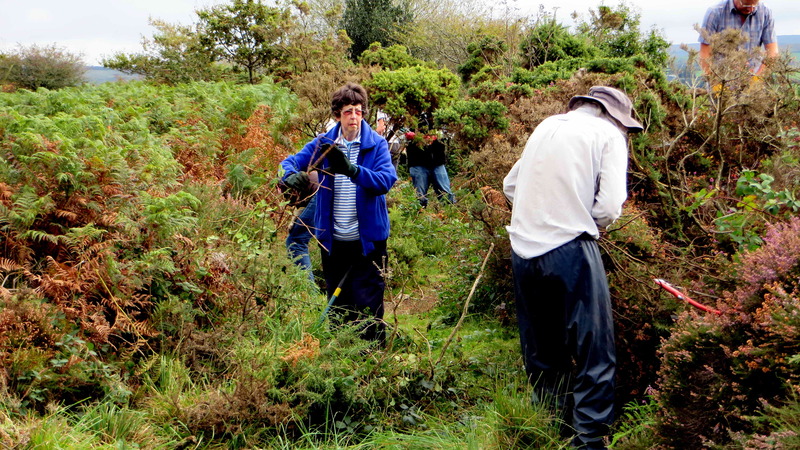 The vegetation to be cleared was mainly bracken, bramble, gorse and hawthorn – some of the gorse was 25-years old. Believe it or not, there is part of a 28-mile long Georgian archaeological feature here! 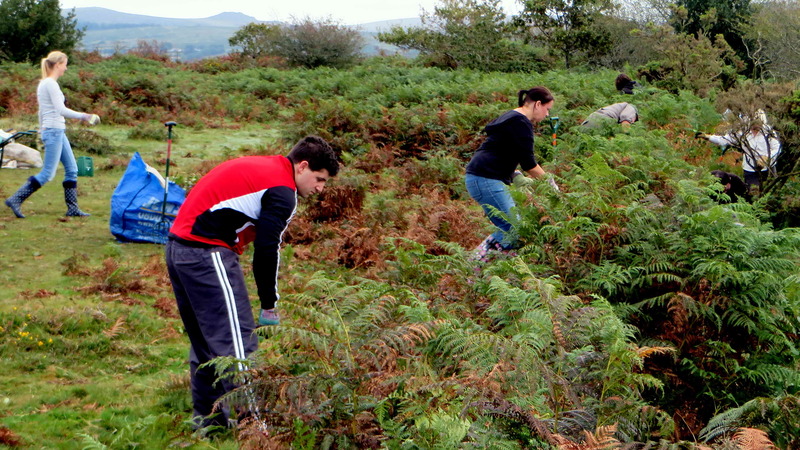 Some of the Exeter University volunteers coming to grips with the task. We were joined today by Andy, Emily, Jaki, Jemma, Michelle, Mike, Nick, Nicola, Sarah and Scot from the University of Exeter, and very productive they turned out to be. We were very grateful for their efforts. Beginning to see a difference. 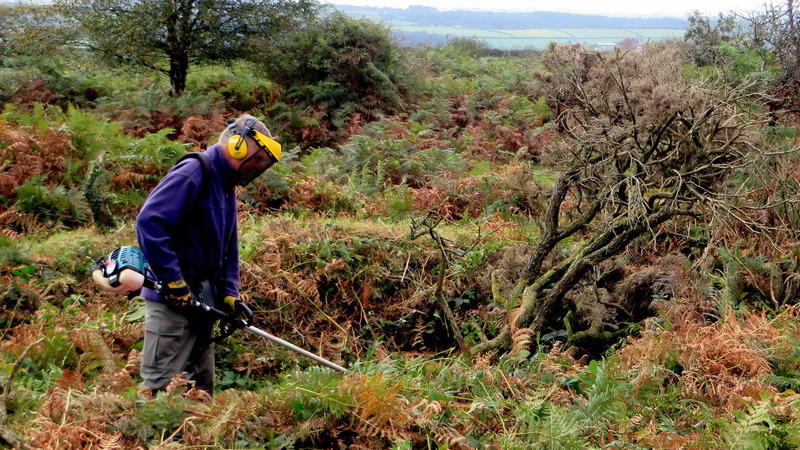 The photograph above shows how the work progresses as scrub is removed and the shape of the leat becomes clearer. One machinist deep in thought and concentrating ….. 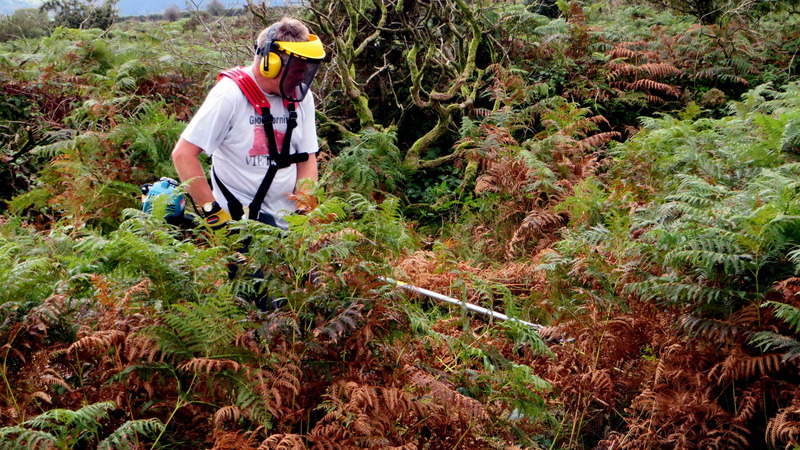 There were three brushcutters in use, especially against the brambles ….. 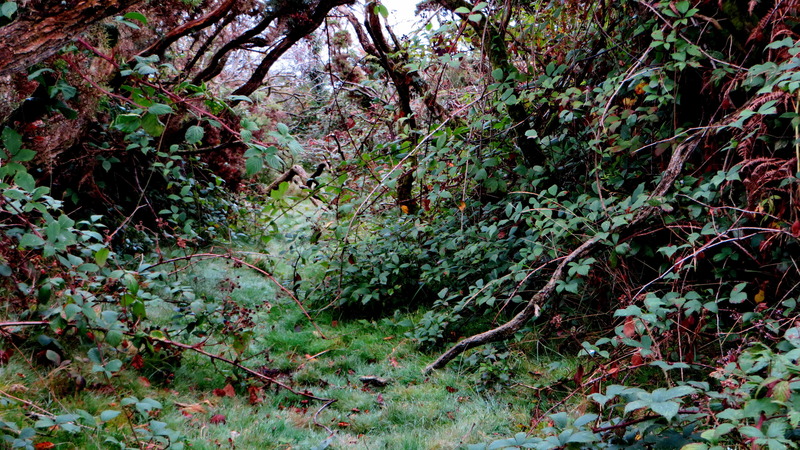 The photograph above underlines how deep the vegetation can be, although it can be worse than this. 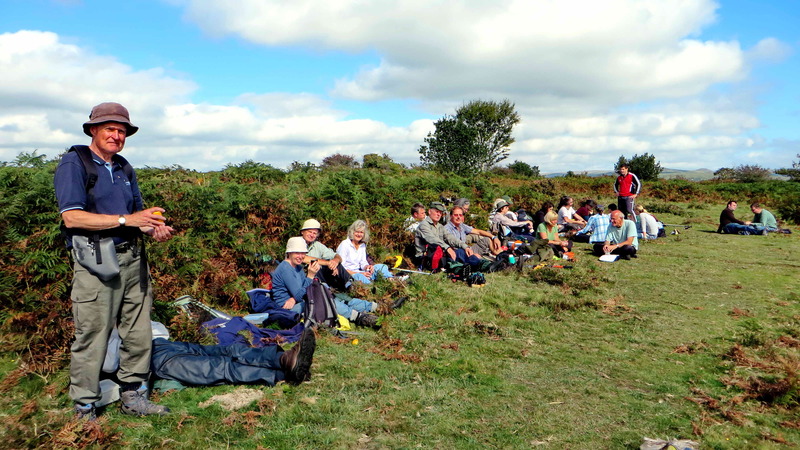 Scene 1 at lunchtime …..
Our visitors from Exeter were introduced to a leat favourite – cake! Today, Sylvia provided peach and ginger cake as well as cherry oat cake – spoiled again! 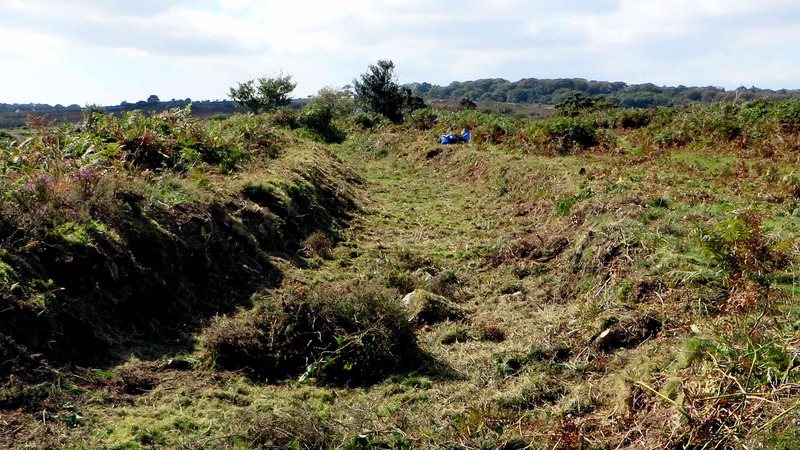 The final result was that we finished clearing 106 metres of leat but that another 53 metres were more or less cleared of gorse and awaited attention from the machine operators to cut the bracken and brambles. A Google Satellite view of the work can be seen HERE. You can zoom in / out with your mouse thumb-wheel or + / – keys. You can also drag the map around. Have fun, and thank you, University of Exeter. We hope you had a good day. PS – You can click on these images to see a larger version – then toggle your F11 key to make full screen. Click the browser back arrow to return to normal view. Glad you made it out with us, even with the Freshers Flu! I hope the fresh air helped to clear it. 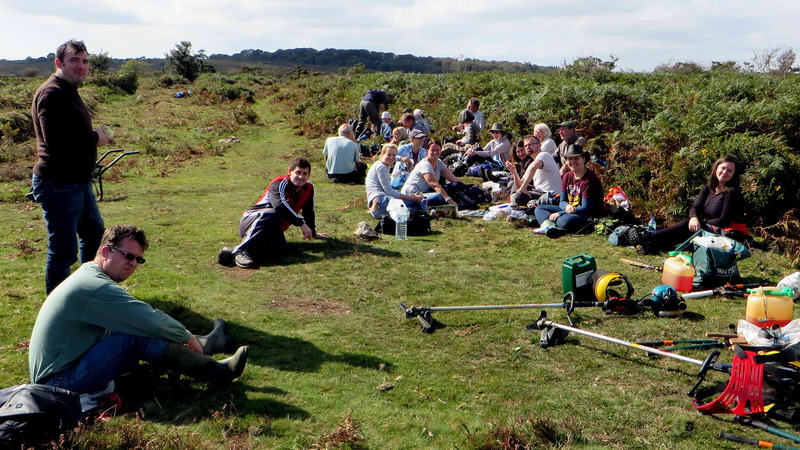 We did appreciate you all coming and helping is for the day and getting so much done!